Event Forms can be set up to share data between a parent and a child site. 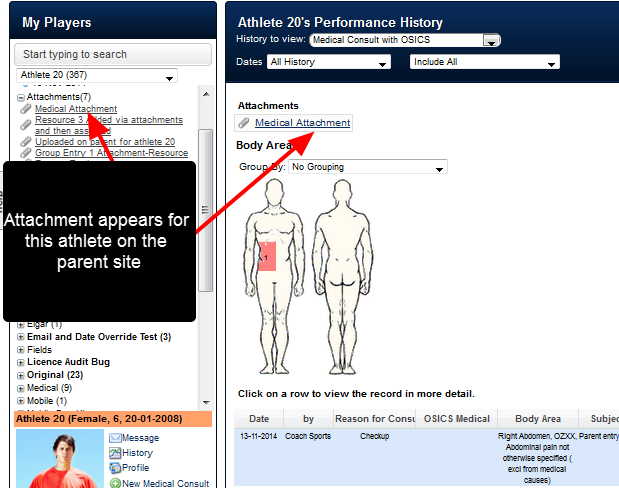 For any athletes which are shared between a parent and a child site, the data will appear in both sites for these shared athletes. Previously however, if an attachment was uploaded to an Event Form, there was no way to share the attachment between the parent and the child site and it would only be retained in the site it was uploaded in. 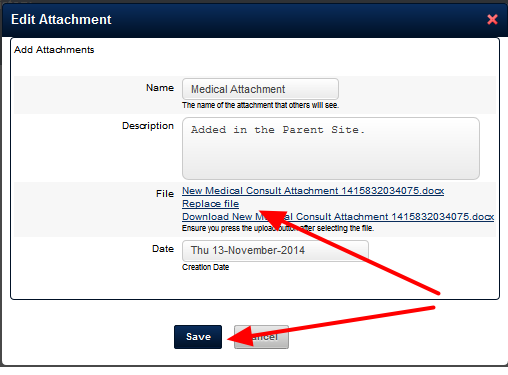 A File Uploaded into a field in a shared Event Form on the parent site will be available on the child site (as shown here). This Event Form is linked between a parent and a child site. Data is being entered into it on the parent site. 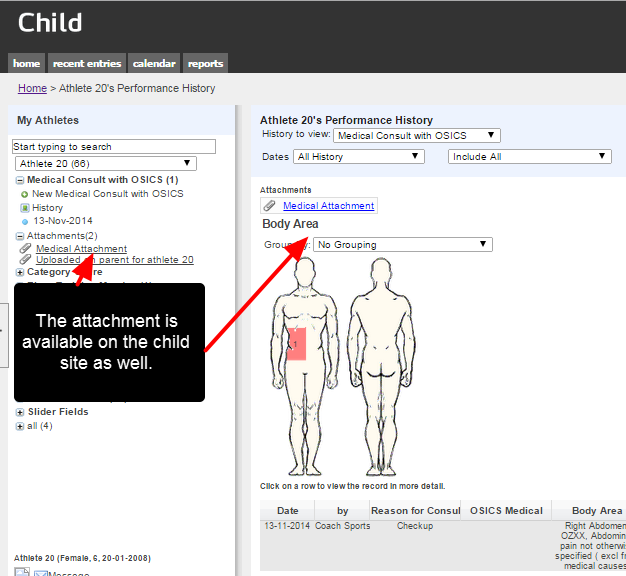 The Attachment also appears on the child site in the exact places. 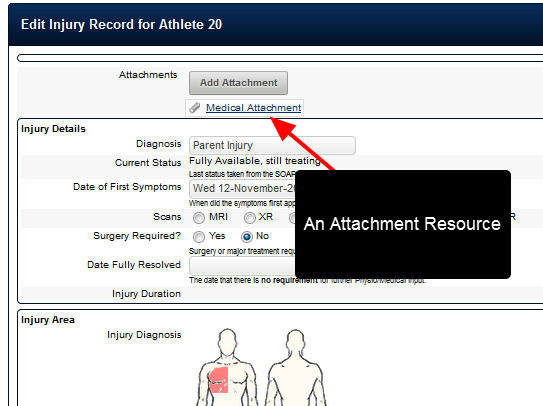 Because access to attachments Resource is restricted by the Category which the attachment Resource is stored in, the Category that is it stored will ALSO need to be linked between the parent and the child site. Then the user on the child will also need to be given permission to access that Category. If the Category is not shared, then the Event data can be accessed, but the attachment cannot be accessed. 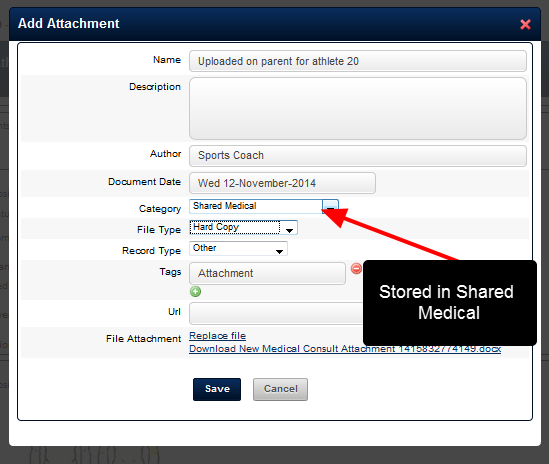 Zoom: If the Category is not shared, then the Event data can be accessed, but the attachment cannot be accessed. 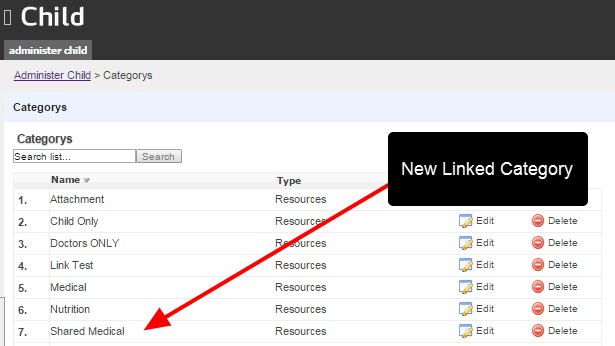 The example here shows that the Category has not be linked between the Parent and Child site. Hence, the attachment is not accessible. 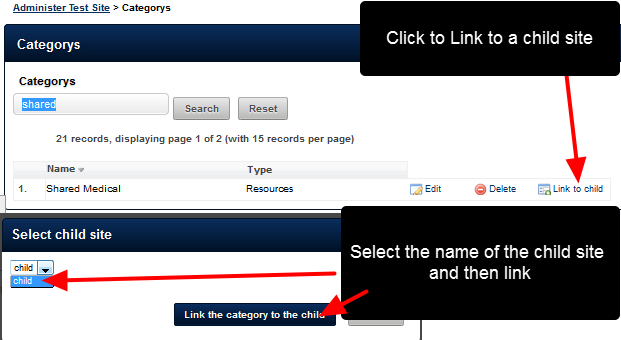 On the Parent Site, the Categories (set up on the Admin site) now all appear with a "link to child"
Click on the "Link to Child" to link this Category to a Child site. 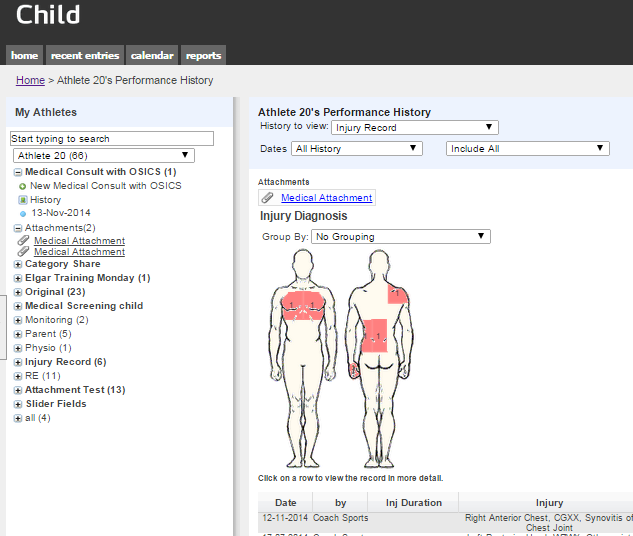 A Resource uploaded into the My Resources Module is being assigned to athletes. 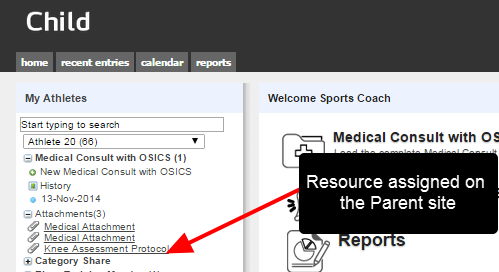 For user that have access to the shared athlete AND the shared category, any Resources assigned to an athlete on the parent site will appear on the child site. 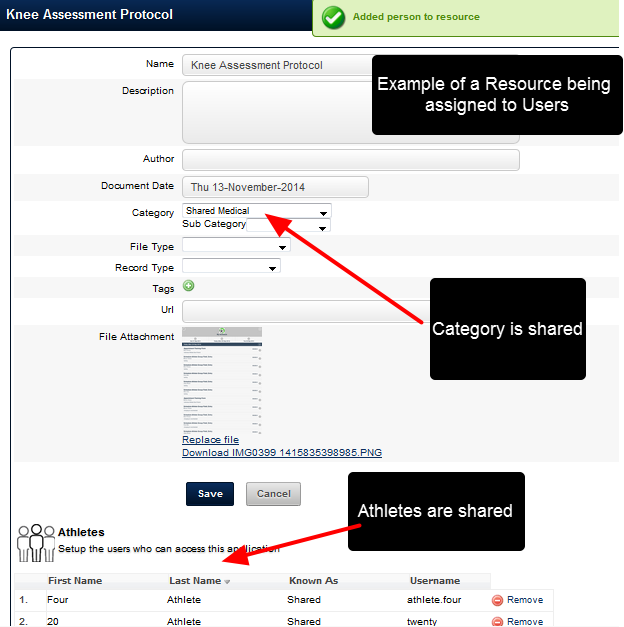 A user MUST have access to shared Event Form, the shared Athlete AND the shared Category to access the Attachment Resources and the Assigned Resources. N.B. If a form is NOT shared between a parent or a child site, then NO data will be shared. 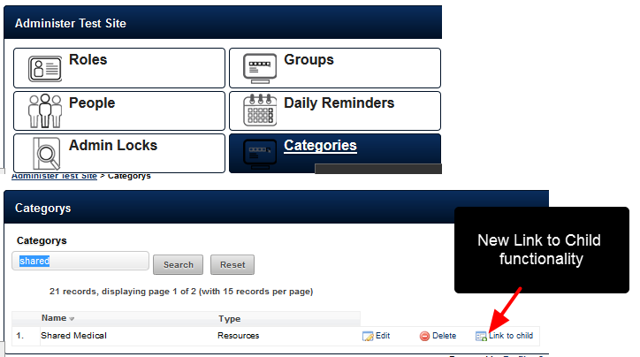 Next: New Users can now Register for the system on a Registration Page.